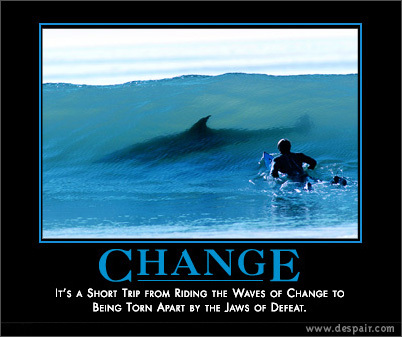 How does your company handle major change? Although many large technology initiatives fail because an inadequate or inefficient change management framework, many companies still lack a consistent approach in supporting their employees and external stakeholders through major system implementations and other significant business initiatives. The roles and responsibilities for communication, training, and monitoring performance remain vague. The approach varies from department to department. Information is pushed out once in the wrong format (usually by email) and not made available on a portal under version control. We see this often in companies that have an immature or outdated collaboration style. We’ve put together a short poll on change management approaches. Please take a moment to tell us how your organization handles major change, and share your thoughts in the comments. Do you see the recession as an opportunity or are you panicking? The Dow was down about 200 points earlier this week – is that bad or good? The Dow has been picking up fairly consistently over the past 6 weeks or so and this is probably just an “adjustment” rather than another freefall. Is the glass half empty or is it half full? Many people see the down economy as a time to hunker down, sell off their assets and bury the money in Mason jars or hide it inside their mainframe. But for those with the stomach for it, this down economy brings a lot of opportunities; a lot of bargains. Any insurance organization looking to improve IT services can find a lot of good deals on hardware, services, and especially back office systems. However, most insurance organizations, because they are intrinsically risk averse, don’t want to spend the money now, but instead wait and see what happens. When things do turn around, they could find themselves behind the curve, rather than leading the way. A lot of companies are looking for band-aids for their IT problems, quick fixes to get them through the storm. Rather than just repairing the mast and patching the hull on your ship, wouldn’t it be better to have a new, stronger, and more stable ship ready for sea when the storm subsides. Or, even better, fully prepared to weather the storm if it continues, and head out for the deadliest catch. Another benefit to purchasing during a down economy is that as a mid-market carrier, you are likely to get a lot more attention from technology vendors and a better team now because you become a big fish in a little pond, and every customer is extremely important. Because you’re in more of a command position, you can negotiate better services and even more free upgrades because it also becomes an opportunity for the vendor to improve their product. We’re all confident that the economy will turn around, it’s just a question of when. There are those “economic experts” that say September; those that say next Spring; and more that say Summer 2010. If any of them are right, its really not that long a period of time – about the same amount of time it takes to implement a system. When it does, your agents, your customers, and most importantly, your prospects, will be there to move forward with you. So talk to technology vendors now, because just like the car companies, prices have come down and there are deals to be had. Hard times are definitely here. By this time everybody in IT-land has done the obvious: frozen maintenance where possible, put off hardware and software upgrades, outsourced where possible, trimmed heads (contractors, consultants, staff), pushed BI/CPM/EPM analytics projects forward, and tuned up data and web resources. Now is the time to think outside the bunker! IT needs to consider what will need to be done to nurture the green shoots poking through the nuclear fallout. All of the talking heads and pundits see them ( glowing with radiation or whatever) and the utmost must be done to make sure they survive and grow or we shall all sink into the abyss! This is the time to double down in IT (poker speak). It is not about heavily hyped Cloud Computing or the latest must-have tech gadget, but about something much more mundane and boring: improving the business process. There, I’ve said it, what could possibly be more boring? It doesn’t even plug-in. In fact (shudder! ), it may be partially manual. Business process is what gets the job done (feeding our paychecks!). Recessions are historically the perfect time to revise and streamline (supercharge ’em!) existing business processes because it allows the company to accelerate ahead of the pack coming out of the recession. In addition, recession acts as something of a time-out for everybody (I only got beatings, no time-outs for me), like the yellow flag during a NASCAR race. When the yellow flag is out, time to hit the pits for gas and tires. Double down when it is slow to go faster when things speed up again, obviously the only thing to do. How? is usually the question. The best first step is to have existing business processes documented and reviewed. Neither the staff involved driving the process at the moment nor the business analysts (internal or consultants) are that busy at the moment. That means any economic or dollar cost of doubling will be minimized under the economic yellow flag. The second step is to look for best practice, then glance ouside-the-box to maximize improvement. The third step is to look for supporting technology to supercharge the newly streamlined business process (I knew I could get some IT in there to justify my miserable existance!). Small and medium businesses get the biggest bang for the buck (just picture trying to gas and change the tires on the Exxon Valdez at Daytona) with this strategy. This process allows SMBs to leapfrog the best practice and technology research the Global 2000 have done and cut to the chase without the pioneer’s cost (damn those arrows in the backside hurt!). Plus implementation is cheaper during recession ( I love to be on the buy-side). The hardware, software, and integration guys have to keep busy so they cut prices to the bone. The way forward is clear, IT only needs to lead the way, following is kind of boring anyway.